Rock 120 Head : Amplifiers : Heads : Industrial Amps Inc.
Rock 120 Head  Industrial Amps Inc.
120 Watt, Two Channel Amp Head. 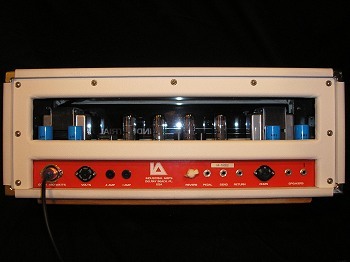 Point to Point Hand Wired Tube Amp Head. Voiced for overdrive to extreme heavy. Great for large live venues. 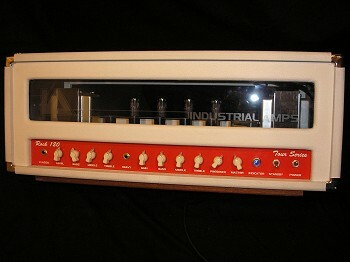 Without a doubt, the best, most original sounding, loudest amp I have ever played. I have been a professional touring musician for over 2 decades. I have owned one of every amplifier known to man and whenever you hear the word “boutique” the first thing that comes to mind is, just another Marshall knock off. I met Tony at an amp show in North Carolina where every amp just sounded like another Marshall clone. When I went over to his table the first thing I noticed was just how “metal” the rock 120 looked. When I hooked up to it and heard it, right off the bat I was blown away! To hear an amp that sounds that good and it sounds nothing like a Marshall. Unquestionably the most original sounding amp I have ever heard. From that point on I started talking to Tony about buying one of his amps and I can say I am the proud owner of 2 Rock 120 power house amps. I still keep in touch with Tony and his customer service is just as awesome as his amps. If you are looking for the best sound, and want to order it from one of the nicest, most polite and honest people in the business, give Tony a call…… Your tone chasing days will be finally be over.